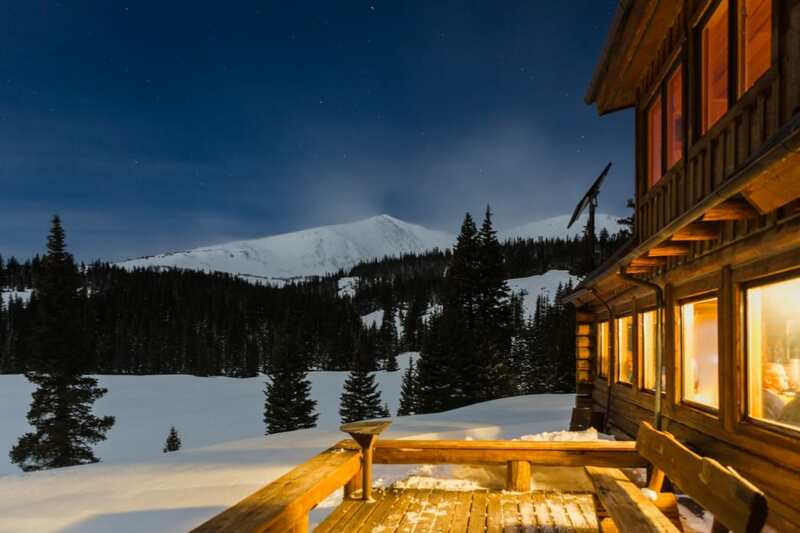 If you’re itching for a night in the wild, consider nabbing a bunk in one of Colorado’s many backcountry huts: cozy sanctuaries that are especially popular in the winter. The 10th Mountain Division manages a system of 35 huts, accessible by skiing or snowshoeing when the snow flies, and hiking or biking in the summer. After a day exploring the mountains, there’s nothing better than relaxing with friends by the fire as the aroma of a simmering stew fills the hut with the promise of an impending feast. Settle in, play a game or two, and tilt back a bottle of spirits to warm your insides. All you need is food, clothing, and a sleeping bag. Toss your bag on a bunk (mattresses and pillows are provided), throw on some comfy clothes, and enjoy a respite from the hectic pace of everyday life, with fire flames licking up the sides of the wood stove and an adult beverage in hand. 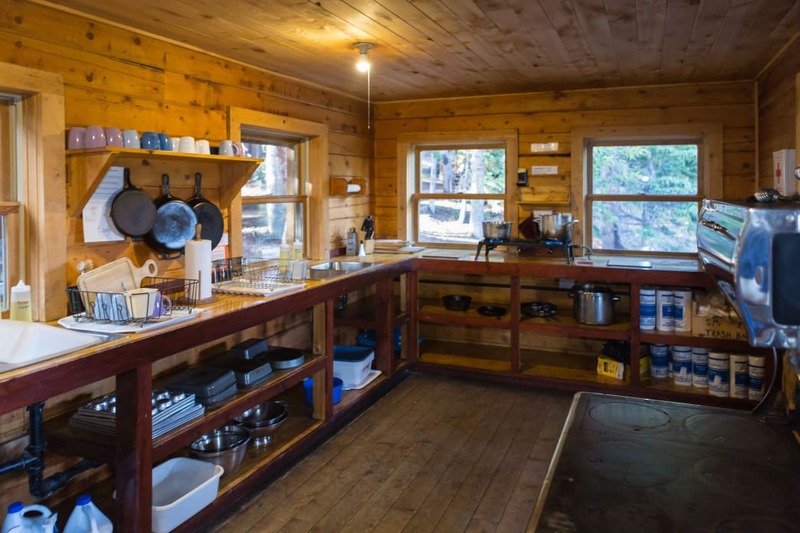 And there are more creature comforts than you might expect: Some huts even have saunas, and kitchens come with equipped with propane stoves and all the cookware and dishes you’ll need. Some also have running water (though at others you’ll melt snow or retrieve water from a stream). Each hut’s design is unique. This is the Skinner Hut, at 11,620 feet near Leadville. There are endless options for Colorado hut trips; here are some tips to help you plan for your first. For your first trip, choose a hut with a shorter approach and easier route finding. 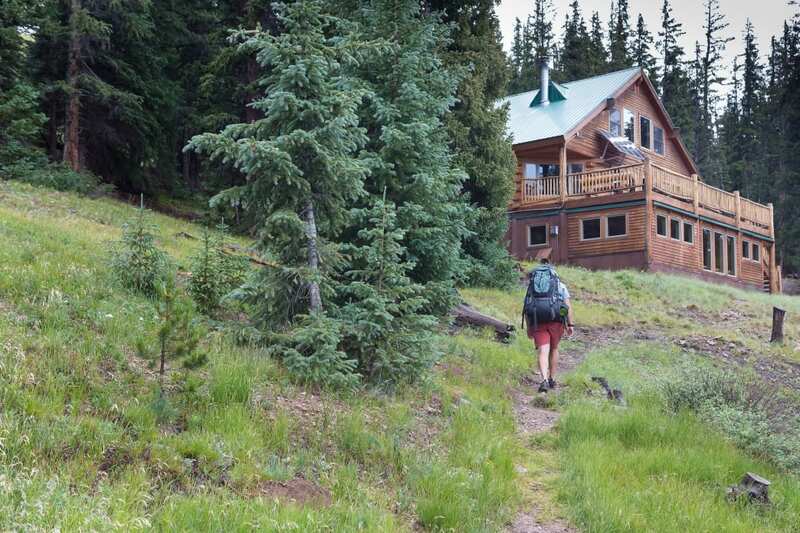 Shrine Mountain Inn (three huts with running water), Continental Divide Cabin (gear delivery available), Point Breeze Cabin , Vance’s Cabin , and the Sangree M. Froelicher Hut are all within three miles of a trailhead. 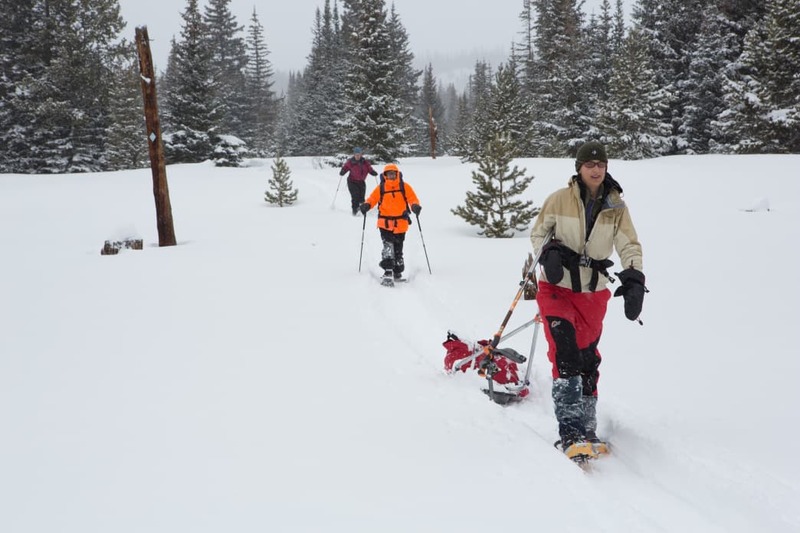 During the winter, when snow blankets the trail, you can pull some of your gear on a sled to minimize the schlep factor. The Broome Hut is a short, steep mile from parking and is a good choice for first timers, with water from a roof cistern and indoor composting toilets. Plus it’s near backcountry skiing on Berthoud Pass. The Sangree M. Froelicher hut outside of Leadville is a 3-mile hike or ski from the trailhead. A hut trip should not be a last-minute affair. No matter how you slice it, your adventure will involve remote travel and exposure to the elements. Thoughtful planning is key to having a good time and staying safe. Pick a destination that is reasonable for your group’s skill and fitness. In addition, keep in mind that huts come with three to 20 beds, so unless you book the whole place, expect to swap stories with new friends. Reservations are a must-do, and the sooner you can do it, the better, especially for prime dates; you’ll need to book about a year in advance for those. Mid-week and shoulder season dates are often readily available, but winter weekends are hard to come by. 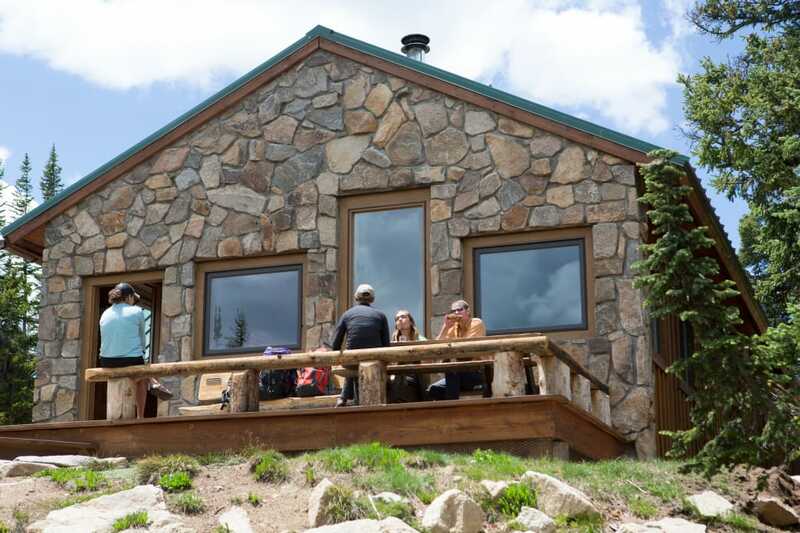 10th Mountain, Summit Huts Association, and Grand Huts Associations members get first dibs via a lottery system. Choose a group leader and make sure someone in your group is adept at first aid, route finding, and avalanche safety. Carry a topographic map and compass and know how to use them. New skis? New sleeping bag? Try ’em out first, as a hut trip is not the time to use gear for the first time. Make sure you’re familiar with all of your equipment, and practice packing in advance. It’s also a good idea to bring a repair kit to avoid having to hoof it back to the car if something goes wrong. When snow blankets the slopes, you can tote heavier loads in a sled. Just make sure the route isn’t too hilly. If you’re heading out with a group, assign meal duties to different people in your party so you can enjoy communal dining—it’s way more fun (not to mention equitable) that way. The closer the hut, the more decadent the food you can bring. Kitchens are well equipped, so if you don’t mind carrying the weight, bring ingredients for a feast. To cut down on trash, remove foods from packaging ahead of time. Prep as much as you can at home. Consider marinating meat and double-bagging it in Ziplocks. For daytime forays, bring easy-to-eat snacks like energy bars, cheese, salami, peanut butter and jelly sandwiches, hard boiled eggs, and jerky. During winter, you have natural refrigeration, so food safety is less of a concern. And remember that you’ll be packing out all of your trash, so plan accordingly for that, too. Hut kitchens are well stocked with dishes and cookware. No matter how close the hut or how easy the route seems, you should build in a big buffer of time to reach your destination. Allow about an hour a mile—longer for family groups. If no trail is packed, or a storm rolls in, you want to make sure you have sufficient hours of daylight to find the hut. Bunking down outside for the night will seriously change the flavor of your trip, and not in a good way. Remember to bring the lock combination to get into the hut. Everyone in your group should carry a copy, to be on the safe side. With a few exceptions, water inside the huts is either non-potable or non-existent. Most likely you’ll need to melt snow, pull water from a stream, or use water from a cistern. Be prepared to treat all water you drink. Use a filter or steri pen , or boil water to kill bacteria. No doubt you’ll want to shed your outdoor layers and throw on comfy clothes when you’ve settled into the hut: Think sweatpants, a cozy top, and hut shoes. Choose footwear that is good for lounging around the hut but can also make the trek outside for wood, water, or the outhouse. If you want to win the hut style award, pack a pair of hut booties . Be sure to pack earplugs, too. Chances are you’ll be sharing a bunkroom with a group of other outdoor lovers. A pair of earplugs can make all the difference between a good night’s sleep and one spent suffering through your bunkmate’s nonstop snoring. The 10th Mountain Hut casts a warm, inviting glow as night falls. No dogs are allowed at the huts, so leave your pooch at home and stay away from yellow snow. If all of this sounds great, but you’re unsure about striking out on your own, hire a guide to show you the way. All of this advice also applies to backcountry yurt trips, too. So however you do it, make a hut trip one of your must-do winter activities—once you’ve done one, you’ll be hooked.